What do our Spanish Students think? We take pride in our school and the quality of the services that we offer. Each student fills in an anonymous survey at the end of their study period with us. This is intended to give us accurate feedback to monitor our performance in all areas, and information that will allow us to improve in the future. Below you can see the scores out of a maximum of 5 that our students have given us on each of the questions that we have asked in our survey so far this year. Below the graph are the actual scores for each of the questions. Read Our Spanish Student Testimonials! 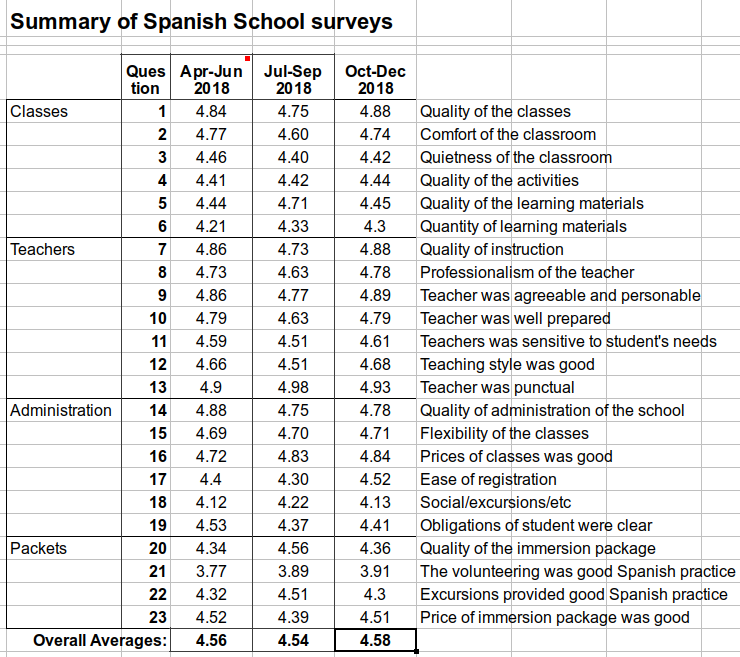 Our Spanish school survey is divided into sections that explore each aspect of the running of the school. Every 3 months we sum up the results and publish them here. The results are consistently high with slight variations depending on various factors that we work to improve all the time. We leave a space on each survey form for students to make their own comments. Visit our testimonials page to read the unsolicited views of some of our students.